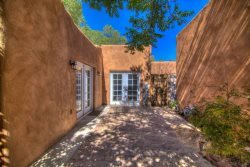 This beautiful authentic Santa Fe home is tucked off Garcia Street and Arroyo Tenorio, in the historic Eastside of Santa Fe. Located two blocks from Canyon Road, five blocks from the Plaza, and one block from an adorable coffee shop, Subscriptions. The private courtyard is lush with vegetation. Its thick adobe walls and original floor plan comport with strict guidelines, thus maintaining its authenticity, in this part of Santa Fe. The home has been updated to offer amenities and comfort to visitors, with features reminiscent of those in favor at the time it was constructed. An example is stepping over the raised door frame to get into the master bedroom. Bathrooms are somewhat tight as it was important to save space as a number of families lived in the home when just built. Hardwood floors with vigas (support beams in ceiling) warm the central living space while the home provides comfortable beds, a spacious living room/dining room, cable TV, internet, a washer/dryer, and a fully equipped kitchen. Open living room adjoins the dinning nook and kitchen, all clean and bright in white. Living room has fireplace. Outside living and dining in a private garden patio, with coyote fencing make relaxing easy.